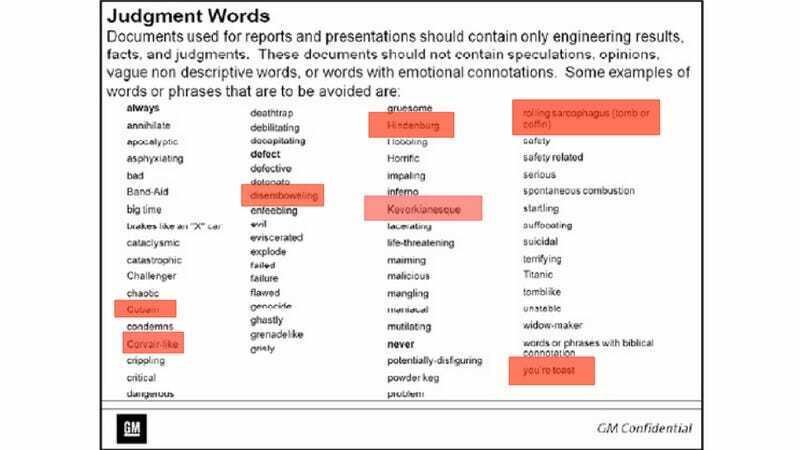 Today we learned that GM has a list of phrases that are not allowed to be used during vehicle evaluations after hearing about their $35 million fine for delayed recalls. Phrases like Corvair-like and Hindenburg are banned. And probably because they were used at some point in the development process. Engineers need feedback that can help them identify a problem. Saying things like "good" and "bad" don't really give the engineers the data they need. But the people testing GM's cars needed very specific parameters, because it seems they were using some very odd phrases. They can't say it needs a "Band-Aid." They can't say that it's "Corvair-like" or "Kevorkianesque" or like the "Hindenburg" or compare it to the "Challenger" shuttle disaster. For some reason you can't say things about Kurt Cobain when describing a car or say that it's a "rolling sarcophagus" or use any synonyms. They can't say "you're toast" or even that it's "flawed." Colorful language is outlawed. We'd bet the reason this document exists is because all of these words were used at one point or another to internally describe a car. The scary thought is that these words might have been used to describe a car and now, with the glut of recalls, we have to question if they were ever fixed at all.